These terms and conditions (“Terms“) apply to the entire website under the top level domain name livingarchive.cdu.edu.au (“Website“) and form a binding contractual agreement between “you”, the user of the Website, and Charles Darwin University (“CDU”, “we” or “us”). These Terms are important – please read them carefully. Your use of the Website is an acknowledgement that you have read these Terms and constitutes your agreement to abide and be bound by these Terms. Should you have any questions in relation to these Terms, you should contact us at livingarchive@cdu.edu.au before you use the Website. By using and continuing to use the Website you acknowledge and agree that you have had sufficient chance to read and understand the Terms and you agree to be bound by them. If you do not agree with any of the Terms, do not use the Website and you must leave the Website immediately. 1.1 Whilst every effort has been made to ensure the information contained in this Website is correct and current at the time it was first published on the Website, to the full extent permitted by applicable law we make no representations or warranties of any kind, express or implied, about the completeness, accuracy, reliability, suitability or availability with respect to the Website or the information, products or services contained on the Website for any purpose. To the full extent permitted by applicable law, the information contained on the Website is provided in good faith, purely for informational purposes only and on an “as is” basis. Any reliance you place on the information contained on the Website (including the currency, accuracy and completeness of training packages) and any action you take in reliance on such information is strictly at your own risk. 1.2 This Website contains text, graphics, images and information that is provided as strictly general information only. We make no representation that the information contained on the Website is advice which can or should be relied on. (d) do not apply legal terms or technological measures that legally restrict others from doing anything that the licence permits. (b) Indigenous Cultural and Intellectual Property (ICIP) found here. 3.1 Subject to the above terms, we reserve the right to release the Work under different licence terms or to stop distributing the Work at any time. However, any such release will not serve to withdraw this Licence (or any other licence that has been granted under the terms of this Licence), and this Licence will continue in full force and effect unless terminated as stated above. 4.5 The Website is intended for use by residents of Australia only. However, this Website may be accessed from countries other than Australia and if you access and use the Website outside Australia you are responsible for complying with your local laws and regulations. 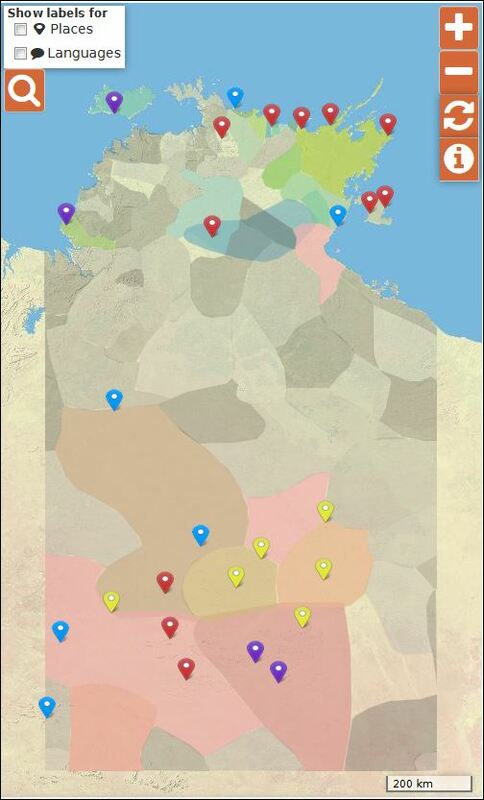 5.1 This Website may contain the names and images of Aboriginal and Torres Strait Islander people now deceased. This Website may also contain links to other sites that may use images of Aboriginal and Islander people now deceased. We respect cultural sensitivities and will take reasonable steps to stop the use of your name and image on the Website once we have received written notice that you have passed away. However, despite those efforts, your name and image may still be published and distributed or remain in circulation. Please contact us at livingarchive@cdu.edu.au if you have any concerns, or you wish to contact us about names and images that should be removed. 6.1 The Website may contain links to third party sites. We have not reviewed these websites and cannot vouch for the content on their pages. We are not responsible for the condition or content of those sites. You access those sites and/or use the site’s products and services solely at your own risk. The links are provided solely for your convenience and do not indicate, expressly or impliedly, an endorsement, sponsorship or approval by us of the sites or the products or services provided on such sites. 6.2 You are welcome to link to the Website provided you do so tastefully. If we feel your link is not in good taste, is damaging to our brand, or for any other reason, we reserve the right to withdraw the right to link to the Website. You agree to remove the offending link immediately upon our request for you to do so. 7.1 Nothing in these Terms constitutes a transfer of any intellectual property ownership rights. You acknowledge and agree that, as between you and us, we (and where relevant, our contributors) own all intellectual property rights in the Website. 7.2 You must not print, publish, modify, link to or distribute any content from the Website or any other documentation that we provide to you, unless you have complied with the License and these Terms. Further, you must not download any content unless you see a “download” or similar link displayed on the Website for that content. 8.1 To the full extent permitted by law, CDU, and its employees, agents and consultants, and all parties who have contributed content that form part of the Works (the “Indemnified Parties”) exclude all liability in respect of loss of data, interruption of business or damage (including consequential, special or incidental damage) arising from the use of, or reliance on, any information on the Website whether or not caused by any negligent act or omission. 8.4 The content on this Website, linked websites and social media sites may include views or recommendations of third parties which do not necessarily reflect our views or indicate a commitment to a particular course of action. To the maximum extent permitted by applicable law, we will not be liable for any direct, indirect, incidental or punitive damages, including loss of profits, goodwill or intangible losses resulting from any delay in removing or failure to remove content from the Website or any linked social media site after receiving a request for removal even if we knew or should have known of the possibility of such loss or damage and whether damages are claimed in contract, tort (including negligence) or statute. (c) any willful, unlawful or negligent act or omission by you. 8.6 These Terms are to be read subject to any legislation which prohibits or restricts the exclusion, restriction or modification of any implied warranties, conditions or obligations. If any law prohibits the exclusion of such warranties, conditions or obligations, CDU limits its liability to the extent permitted by law, to the re-supply of the information. 9.2 We may otherwise terminate these Terms immediately, on notice to you (solely at our option), if you have, in our reasonable opinion, breached these Terms in any way, and we may also terminate the Licence in accordance with the terms of the Licence. 9.3 Clauses 1 (Disclaimer),2 (Copyright Licence),5 (Images of Aboriginal and Torres Strait Islander People),7 (Intellectual Property Rights),8 (Liability),9 (Termination),10 (Disputes),11 (General), 12 (Privacy) and14 (Governing Law and Severability) shall survive the termination of these Terms. 10.1 Prior to resorting to any external dispute resolution process, you and we agree to use best endeavours to use mediation and negotiation to resolve any dispute arising out of or relating to these Terms. Please notify us in writing at livingarchive@cdu.edu.au of any dispute you may have in respect of these Terms. 12.3 We do not disclose your personal information that we collect through the Website to third parties without your consent, unless required by law. For example, we may disclose your email details to the relevant authorities if necessary to protect the safety of the public or to protect the rights and property of CDU. (f) the Internet address of the server accessing the Website. 12.5 Our internet service provider may monitor email traffic for system trouble shooting and maintenance purposes only. 13.1 This Website has been created to specifically provide services to remote Indigenous communities. If you have accessibility issues in relation to the Website, particularly if you are from a remote Indigenous community, contact us at livingarchive@cdu.edu.au.